Pound out the chicken breasts to about ½ inch thick and season both sides with salt and pepper to taste. In a bowl combine the feta, artichoke and peppers. Spread the mixture evenly over the inside of the chicken breasts. Roll the chicken carefully, keeping as much of the filling inside as possible. Secure the chicken rolls with toothpicks. Add the chicken to an oven proof dish, cover in foil and cook for about an hour. While the chicken cooks, add the balsamic vinegar and butter to a small saucepan and reduce until it is less than half the size. Remove the foil and set the oven to broil for about 10 minutes or until chicken is cooked through. 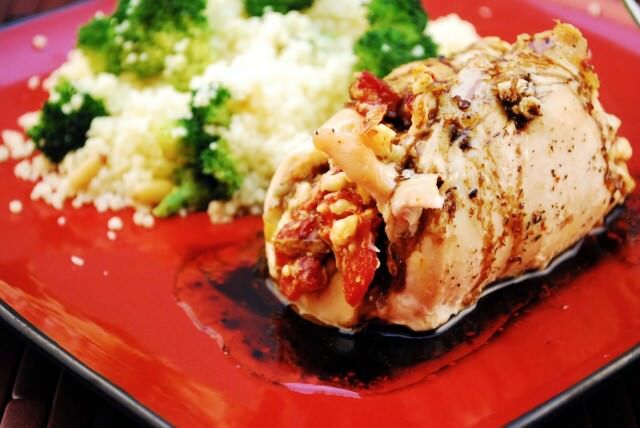 Serve the chicken with your choice of sides and a small amount of the balsamic reduction poured over each chicken roll.